Toyota develops its vehicles and technology under the umbrella of an ‘Integrated Safety Management Concept’, one part of a three-pronged approach which involves continual improvement in vehicle safety as well as initiatives to improve driver and pedestrian awareness and to create a safe traffic environment. Toyota’s eventual aim is to realise a society where traffic accidents are a thing of the past, which is why decades of research into safety technologies have resulted in Toyota cars receiving consistently high results in Euro NCAP crash safety tests, with the Prius, Yaris, Auris, Verso, Avensis and RAV4 achieving the maximum five-star award. Debuting in 2003, Toyota’s Pre-Collision System brings a number of safety technologies into play under the control of a constantly vigilant radar system. The radar continually monitors the road ahead to predict possible collisions, at which point it triggers an audio-visual alarm to alert the driver, activates the Brake Assist system, pretensions the seatbelts in anticipation of an impact and can even engage the brakes to minimise possible damage and injury on impact. Toyota’s Pre-Collision System is available as standard or optionally on all Toyota passenger vehicles except Prius Plug-in and GT86. 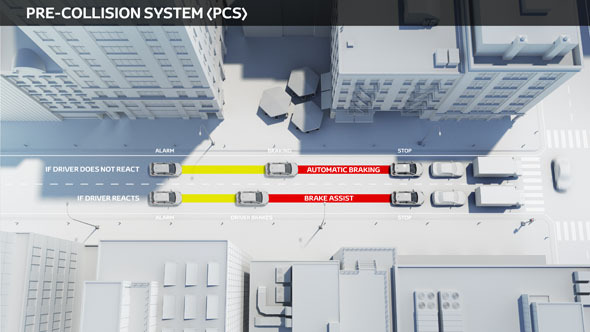 PCS has been developed further to include a Pedestrian Detection feature, adding an extra layer of safety to the system for the peace of mind of drivers and pedestrians alike. This enhanced system, demonstrated in the video below, is available on the new Prius. Even though most of us think of the Anti-Lock Brake System (ABS) as a relatively recent innovation of the past 25 years, Toyota developed its first ABS system in 1967, and followed it up with two-wheel ABS in 1971 and four-wheel ABS in 1983. Most people are aware that ABS prevents a car’s wheels locking and brings you safely to a stop sooner, but its primary purpose is to maintain steering control during sudden braking, with shorter stopping distances resulting as a by-product. ABS works by monitoring the speed of each wheel to detect when a wheel locks under braking. When this happens, ABS releases the braking pressure momentarily before re-applying the optimum braking pressure to each wheel. By rapidly pulsing the brakes in this way, steering control is enhanced so that a potential collision may be avoided. This extra control also helps to improve the car’s ability to stop. ABS is fitted as standard across all of Toyota’s current range of passenger and commercial vehicles. 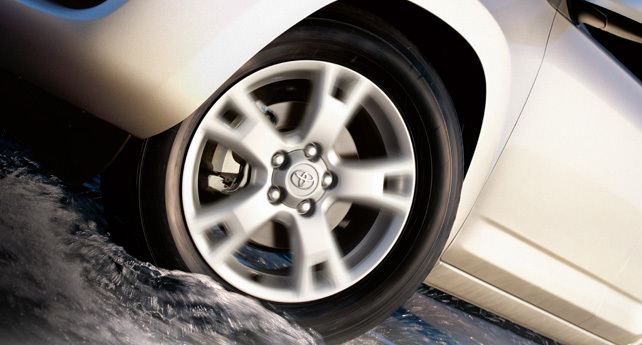 Brake Assist (BA) is a supplementary braking technology that Toyota has used since 1997 and works in conjunction with ABS. Research conducted by Toyota shows that nearly half of all drivers do not step on the brake quickly and strongly enough to stop the vehicle in the case of an emergency, so Brake Assist was developed to help with that situation. Brake Assist detects an attempted emergency stop based on the level of force and the speed with which the driver steps on the brake pedal. The BA system then adds additional braking pressure, helping to bring the vehicle safely to a stop in the shortest distance possible. Except the Aygo, all Toyota passenger vehicles are fitted with Toyota’s supplementary Braking Assist technology. In 1999, Toyota introduced ABS with Electronic Brake force Distribution (EBD), an additional system that works to minimise stopping distances in conditions that fall short of triggering the ABS. The amount of passengers or the load being carried can affect a vehicle’s stopping distance, so EBD counters this effect by varying braking pressure front-to-rear and side-to-side dependent on the conditions. This is accomplished through the constant monitoring of the ABS sensors which indicate the wheel with the most grip and takes place with no additional input from the driver, actively managing the braking process to achieve the best braking performance possible. All Toyota passenger vehicles currently on sale are fitted with EBD.